I won’t name the organization, or even the city—because I don’t want anybody to get fired or to besmirch an entire city. Besides, the employee training lessons to be learned there are applicable everywhere. The key lesson the staff (and I) learned at the Japanese tourist information office I visited was that sometimes staff training has to be undertaken by the clientele—and not just in the form of form-filled suggestion boxes, satisfaction surveys and the like, but as real-time, mid-service employee guidance from clientele being served, while they are being served. . However, the great and useful insight gleaned from this lesson was that such real-time customer-managed employee training could potentially be institutionalized as a core program across many industries, in all countries. Speaking of core training, the city in question is one of Japan’s government-categorized “core” (中核市—chūkakushi) cities, i.e., has a population greater than 300,000 and an area exceeding 100 square kilometers. To earn that designation, a city’s being a major tourism center doesn’t hurt. So, in this instance, additional clientele-supervised training of the staff should not have been necessary, especially in light of the fact that the office was the central tourist information facility, located, as such key facilities are, at the city transportation hub—in this case, the central train station. Not only should that clientele-based training not have been necessary, but before it became evident that it was needed, that need for it would have been inconceivable, given the twin facts that 1.It is the central tourist information center in a major tourist destination; 2. It is Japan—renowned for its “customer-is-God” (“O-kyaku sama, kami sama desu“) customer service. —I check into my semi-elegant hotel before my room is ready. I’m told that I can temporarily store my belongings (including the computer I’ve written this on), but only in a public, unsecured area (presumably since, after all, this is Japan and no one steals anything). It was recommended that I take all of my belongings with me while sightseeing in the heat, until the room is ready. —Instead, I go to the tourist information office and find a locker like the one shown in the photo. Notice the English notices. These are the only ones: “Please take out by 5:00 PM” and “There is a lost key charge of ¥3000 ($30)”. —I put my stuff (equivalent to compact airline carry-on baggage (two items: my small notebook computer in its case and a small gym bag) into the very large locker and head out. —Within seconds, I realize I left my camera in my bag. 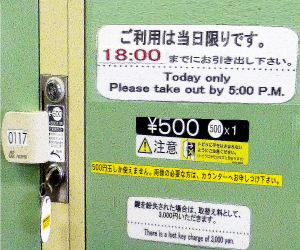 At that point, I remembered that the Japanese are not the most explicit people in the world, and worried about whether I can close the locker more than once, even though there was no notice to that effect. Apparently, the management thinks that it is far more likely that I will leave my hand in the locker and smash it than that I may want to retrieve something essential that I forgot to take with me. Maybe I’m old school, but if lockers don’t have timers (as some do, e.g., Universal Studios Florida) or aren’t monitored by staff who hold your stuff for ransom only if you exceed your time limit (also as more used to do), I’d like to imagine that, if the locker administrators are going to go to the trouble of warning us with notices not to slam our hands and heads in the locker, they might also warn us to take what we need and be sure not to leave anything behind—the way Japanese train announcements do. —What happens next is pretty predictable: I ask the two female service staff whether this is the first time that this has ever happened or whether it’s routine. Reply: Not the first time, happens a lot. I ask, so why aren’t visitors warned verbally or with a visible notice? Reply: an apology. I ask why no one has thought of that. Reply: sympathetic shrugs. I growl. I mention that it would be valuable training for them to have been instructed to warn their clientele. Reply: blank nods. Insufficient English would have been no excuse for this, even though, amazingly, their English was in fact insufficient to non-existent, depending on which one of the two staff was addressed. That’s because we were communicating in Japanese, all of what they said I understood. Moreover, if the tourist information staff cannot communicate in English or post a notice in it, that’s another very serious gap in their training and screening that needs to be filled (about which there is more to report, below). —At this point, their RTCMET is well underway. But there is more intense training about to unfold: I still have to leave my stuff in that locker for a few more hours. I’m not shy about complaining that now I have to spend $10 on that locker. Reply: Not necessary. Oh? They’ve taken pity? Feel guilty? Just want to do the right thing? Wrong guesses. No, instead, one of them points out that it will cost me only ¥300 ($3 for the “refill”, so to speak). Again, I’m thinking “discount?”. Nope. Cheaper lockers—on the far side of the room, an option that was neither mentioned by them nor indicated in any notice. A glutton for punishment, I ask why I wasn’t told that in the first place. Reply: “Your bags looked very big.” (Right…my 1-pound computer and 10-pound gym bag looked oversized.) Grudgingly, I prepare to put my stuff in the smaller locker, which easily could have held twice as much. And my upper body, which I partially inserted, to make my point. —Now I ratchet up the RTCMET into high gear: I tell them that I will make a deal with them; I will pay the extra without complaining further, if they promise they will alert visitors to these issues and will practice English warnings, now, in real time. So, I organize an impromptu English lesson: “You cannot open the locker more than once.”…”There are cheaper lockers.” They repeat verbatim and promise to keep their promises. The intended element of humor seemed to have lightened things up a bit, although with a residue of “grrrr” remaining for me. I suspect they were left with feelings of embarrassment, dilute sympathy and, above all, relief that it was over and I would leave. My annoyance more or less dissipated when I realized that I had stumbled upon a powerful customer-service training tool—RTCMET, which I can present to the world. …especially since I’ll be getting paid for having written an article about it.